Butternut squash is one of the common types of winter squash. Like other winter squash, the butternut variety has a hard exterior with firm flesh that is chock full of valuable nutrients, especially vitamins A and C. As a result, butternut squash nutrition may provide several benefits, such as potentially preventing and fighting certain cancers, boosting the immune system, and helping with weight loss. It is no wonder that butternut squash is becoming a very common vegetable in the diets of many people, despite not being around that long. The following article details the nutrition and many benefits of butternut squash, along with some butternut squash recipes for later. Butternut squash is part of the Cucurbita family of fruits, and it is one of the varieties of Cucurbita moschata. From a nutritional perspective, butternut squash is similar to other winter squash, such as acorn squash, Hubbard squash, gooseneck squash, spaghetti squash, pumpkins, and other gourd varieties. Botanically winter squash is a fruit, but it is prepared like a vegetable. Contrary to the name, winter squash is actually grown in the summer and harvested in the fall. However, its tough and thick exterior means it can easily be stored for many months, including winter months. Butternut squash is often cultivated under warmer climates like regions of Central and South America. The butternut squash features an upper elongated, thick neck that is attached to a broad, pear-shaped lower base. The wildly popular butternut squash originated in the 1940s, according to reports. The earliest use of butternut squash apparently began in Waltham, Massachusetts, when Charles A. Leggett, an insurance agent, decided to take up farming and eventually grew squash. He found that the Hubbard squash and gooseneck squash combined well to make a conveniently sized and shaped squash. When asked the name of the squash, Leggett said it was “smooth as butter and sweet as a nut,” which led to the name butternut squash. 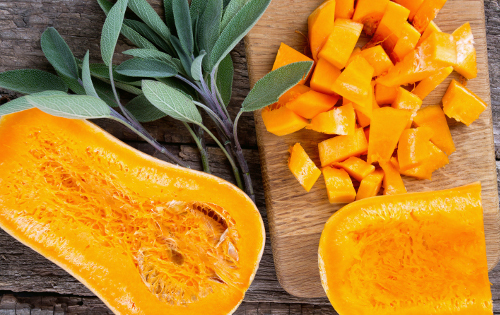 What butternut squash nutrition facts do you need to know? Butternut squash is loaded with nutrients, and it contains four times the recommended daily value of vitamin A in one cup, and over half the recommended amount of vitamin C. There are also 21.5 grams of carbohydrates, 1.8 grams of protein, and 5.75 grams of fiber. Other key nutrients in butternut squash include manganese, potassium, magnesium, vitamin E, vitamin B6, folate, vitamin B1, vitamin B2, vitamin B3, vitamin B5, vitamin K, calcium, iron, phosphorus, zinc, copper, and selenium. The following is a comprehensive butternut squash nutrition chart with information for one cup of cooked and cubed butternut squash. What are the health benefits of butternut squash? Butternut squash is particularly high in antioxidants, including three vitamins: A, C, and E, and three different carotenoids: beta-cryptoxanthin, alpha-carotene, and beta-carotene. Carotenoids are fat-soluble antioxidants that are efficiently absorbed into the body when paired with fat sources like avocado or olive oil. The antioxidants in butternut squash may help reduce inflammation, protect against lung infections and pneumonia, and prevent and treat autoimmune disorders and certain cancers. The key antioxidants and other nutrients in butternut squash are very important for decreasing your risk of cancer. For instance, vitamin C in butternut squash may treat ovarian and lung cancers. A particular protein called Moschatin found in mature seeds of C. moschata has been found to inhibit the growth of skin cancer cells, according to an experiment published in the journal Cell Research in 2003. Butternut squash could also help you maintain strong bones. In the U.S., osteoporosis affects nearly 50% of all women between the ages 45 and 70. Fortunately, the high potassium in butternut squash is important for promoting denser and stronger bones in older men and postmenopausal women. When taken with calcium, zinc, and copper, the manganese in butternut squash may also prevent osteoporosis, particularly in post-menopausal women. Butternut squash is also loaded with vitamin C. Vitamin C may aid physical performance by increasing oxygen the body absorbs from the air you breathe in conjunction with physical exertion. A study published in the journal Molecules in 2012 found that C. moschata was effective in reducing fatigue and increasing exercise performance in mice. Premenstrual syndrome (PMS) is the emotional and physical symptoms that occur one to two weeks before a woman has a period. However, the food women consume before and during their period may improve symptoms. For instance, foods high in potassium and manganese like butternut squash may help relieve PMS symptoms. Women with low manganese levels seem to experience greater severity in mood and pain PMS symptoms. The potassium in butternut squash could potentially treat and prevent muscle cramps as low levels of the mineral are linked to the condition. Butternut squash benefits people looking to lose weight. A study published in The Journal of Biological Chemistry in 2012 found that an extract from winter squash like butternut squash has effective anti-obesity properties. For instance, butternut squash impacts various cellular processes like the formation of fat called lipogenesis. The extract essentially stops the body from producing new fat to store. The high fiber in butternut squash also helps with weight management and increase satiety. Butternut squash is a versatile plant that can be roasted baked, boiled, or steam-baked. To prepare the butternut squash, first cut the top and bottom halves of the squash and the slim “gooseneck” from the fatter bulbous area. Use a sharp peeler to remove the thick skin from the butternut squash. From the bulb, you will remove the needs, which can also be roasted like pumpkin seeds. Finally, slice the squash into one-inch cubes. Still confused on how to get started with butternut squash? There are many ways to enjoy the sweet buttery flavor of the butternut squash. Let’s take a look at a couple easy and delicious butternut squash recipes that you’ll likely add to your regular rotation of weekly meals. Preheat the oven to 375 degrees F. Remove the skin from the butternut squash with a vegetable peeler, then slice it in half lengthwise, and remove the seeds. Slice into one-inch pieces, and roast for 30 minutes. Brush the roasted butternut squash and pineapple with melted butter, ghee, or coconut oil, and season with the spices. Place onto a grill over medium heat. If you don’t have an outdoor grill, you can use a grill pan indoors for the same effect. Grill the butternut squash and pineapple for about three to five minutes per side. Garnish with shredded coconut, and serve warm. Heat olive oil in a large skillet over medium heat. Once the oil is shimmering, add the sage and toss it to coat. Let the sage get crispy before transferring to a bowl. Sprinkle with sea salt, and set the bowl aside. Add the butternut squash, garlic, onion, and red pepper flakes to the skillet. Season with pepper and salt. Cook and stir occasionally for about 10 minutes. Add the broth, and bring to a boil, then reduce the heat and simmer until liquid has reduced and squash is soft. It should take 15 to 20 minutes. In the meantime, bring a large pot of salted water to a boil, and cook the pasta according to package instructions, and stir until al dente. Drain, and reserve one cup of cooking liquid. Once the squash mixture is done cooking, remove it from the heat, and let it cool. Transfer the pan contents to a high-speed blender, and reserve the skillet. Puree the mixture until smooth, and season with salt, pepper, and other choice spices. Combine pasta and the squash sauce, and a quarter cup of the cooking liquid in the reserved skillet, and cook over medium heat, and toss while adding more pasta cooking liquid as needed, and until the sauce coats the pasta. Season with more pepper and salt if needed. Serve pasta with sage and nutritional yeast. The recipe makes four large servings. 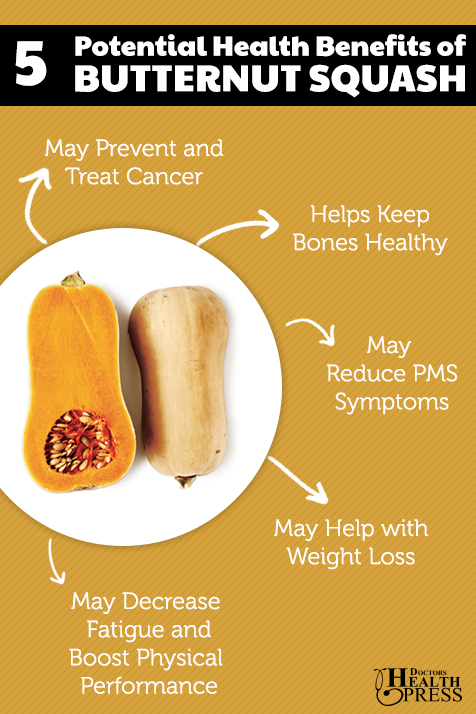 Butternut squash can easily add to the health benefits of any diet. But, like many foods, butternut squash may cause an occasional allergic reaction that includes redness, itching, and swelling around the mouth or hands. Some people that peel raw butternut squash will experience drying and peeling of the skin on the hands. This is not considered an allergic reaction, but rather a result of the butternut squash’s natural defense mechanism: sap. To be on the safe side, try wearing gloves before cutting or peeling the vegetable. “Squash, winter, butternut, cooked, baked, without salt Nutrition Facts & Calories,” SELFNutritionData; http://nutritiondata.self.com/facts/vegetables-and-vegetable-products/2648/2, last accessed March 17, 2017. Ware, M., “What are the health benefits of butternut squash?” Medical News Today, Oct. 28, 2014; http://www.medicalnewstoday.com/articles/284479.php., last accessed March 17, 2017. Mateljan, G., The World’s Healthiest Foods: Essential Guide for the healthiest way of eating (Seattle: George Mateljan Foundation, 2007), 238-243. Brady, K., “* Incredible Butternut Squash Health & Nutrition Benefits (Plus Recipes! ),” Organic Authority, Nov. 24, 2015; http://www.organicauthority.com/8-incredible-nutrition-and-health-benefits-of-butternut-squash/, last accessed March 17, 2017. “Butternut squash nutrition facts,” Nutrition-and-you.com; http://www.nutrition-and-you.com/butternut-squash.html, last accessed March 17, 2017. “Manganese,” The University of Maryland Medical Center; http://umm.edu/health/medical/altmed/supplement/manganese, last accessed March 17, 2017. Sanfilippo, D., Practical Paleo: A Customized Approach to Health and a Whole Foods Lifestyle (USA: Victory Belt Publishing Inc., 2012), 342. Lee, J., et al., “Dehydroiconiferyl alcohol isolated from Cucurbita moschata shows anti-adipogenic and anti-lipogenic effects in 3T3-L1 cells and primary mouse embryonic fibroblasts,” The Journal of Biological Chemistry, March 16, 2012; 287(12): 8839-8851, doi: 10.1074/jbc.M111.263434. Wang, S.Y., et al., “Pumpkin (Cucurbita moschata) fruit extract improves physical fatigue and exercise performance in mice,” Molecules, Oct. 9, 2012; 17(10): 11864-11876, doi: 10.3390/molecules171011864. Xia, H.C., et al., “Purification and characterization of Moschatin, a novel type I ribosome-inactivating protein from the mature seeds or pumpkin (Cucurbita moschata), and preparation of its immunotoxin against human melanoma cells,” Cell Research, October 2003; 13(5): 369-374. https://www.ncbi.nlm.nih.gov/pubmed/14672560.